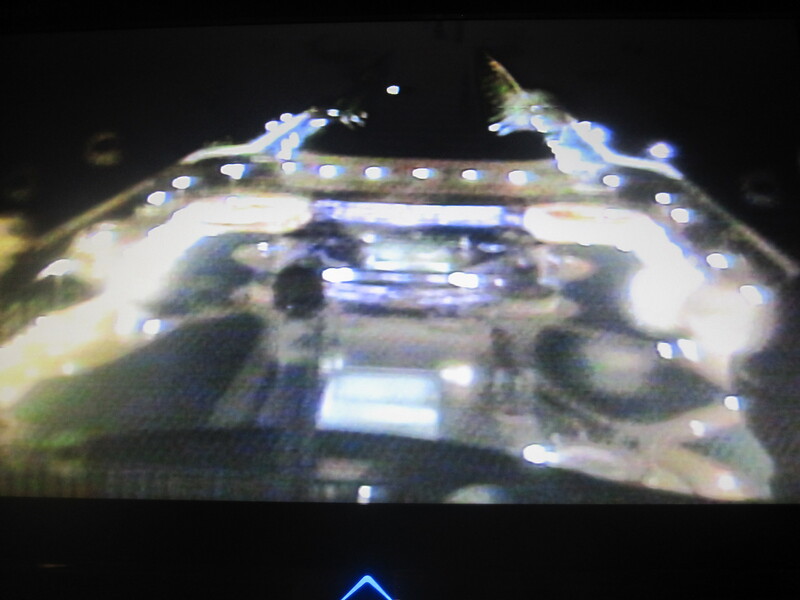 Several months ago I spoke about haunted cruise ships and how I thought it would be exciting to investigate an old liner like the Queen Mary, In that blog I also mentioned of strange goings on aboard Oceana during my April 2012 cruise. Well, you guessed it! There were more strange happenings on Oceana and this time I have some images I want to share with you. I am sure there probably is a reasonable explanation but either way it made for some interesting pictures! We were coming through the Bay of Biscay at the time and she was a little on the grumpy side to say the least, the motion of the ship was pretty intense and my friend and I couldn’t sleep, I like the rough sea’s but sometimes trying to sleep just becomes effort . Finally at roughly 5am after tossing and turning since 3.30am we decided to admit defeat and just get up, get dressed and see what was going on outside. The first thing we do every morning is put the TV on to channel 35, the webcam, just to see what’s going on. On this particular morning we put the TV on and both of us were instantly drawn to the right hand side of the screen. What’s that, I said to my friend. She came across and had a closer look, we both looked at one another like oh my god seriously, what is that?! This photograph is what we saw on the TV in the cabin. You can see where I have marked in yellow that there is a figure standing to the right of the pool; it almost resembles a soldier holding some type of weapon. We quickly got dressed and flew up to the Lido deck. The wind was howling and the ship was really rolling so it made it hard at first to get your balance, being still half asleep didn’t help either mind! We moved across to the pool, all of the wood surrounding it was covered with rain water so we knew obviously it was definitely not one dark patch just casting a shadow. There was not one other soul up here at this time, no crew or other passengers, just us two crazy people and, as you can even see in the image all the loungers and chairs had been moved so again the shadow explanation was ruled out. I have no idea what it was, it probably wasn’t anything ”paranormal” and is simply just the case of a shadow being cast from somewhere but either way it made for an interesting blog! I work for P&O Cruises, and I’ve done night shifts a couple of times. I don’t think this image by the pool is a ghost. He’s probably one of the deck night gang cleaning the pool. The reason he’s not there anymore when you went to the open deck? He may be finished cleaning and gone to do some other job. Were you staying in an inside cabin? You would LOVE the Queen Mary, we just sent my in laws there to stay before their last cruise and they had a ball. My Mother in law swears she senses ghost and said she had one followed her all over the QM. I have personal ghost hunted on it, but never felt or saw a thing. The sensible thing of course! Ran away screaming! 😉 Either that or hit the deck. Creepy! What would you have done if you got there and there was a ghost?